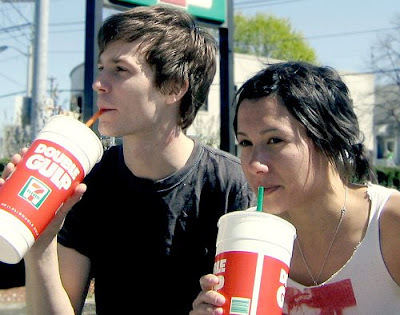 nick c. feldman : the blog: review: Matt & Kim - "Grand"
When Matt Johnson and Kim Schifino met in 2002, they hit it off and started dating. Two years later, the skinny art-school couple from New York decided to start making beautiful music together — literally. Forget that they didn’t know how to play their instruments at the time, or that they don’t really know why they decided to do it. It was a fantastic choice, and Grand is the proof. The sophomore album, recorded in Johnson’s parents’ home in an isolated stretch of Vermont countryside, is a testament to the duo’s dedication. The fact that the whole record was recorded by the duo over a nine-month span — from laying the tracks to mixing and producing — speaks wonders for both their dedication and the absolute realization of their vision. Lyrically, the songwriting process is one that sounds utterly insane but somehow manages to create brilliance: Kim writes random lines of text, and Matt sifts through them until he can assemble something meaningful. The compilations always feel perfect, even if seeming to border on nonsensical. Poppy treble notes and metered bass notes drop into Johnson’s vocals and Schifino’s catchy drums on “Daylight,” Grand’s first track and it’s catchiest. Throughout the album he handles keys and vocals, alternately substituting a heavy left hand for an active right hand, and she drums and chips in with background vocals and harmonies. While Johnson creates some addicting candy-coated indie melodies, it’s just as easy to be struck by Schifino’s drum work. The rhythms are often seemingly simple but expertly placed, and the organic clap-and-snap recordings underscored with hi-hat clang sound far more expert than amateur. Third track “Good Old Fashioned Nightmare” is another genius work of pop music, with keyboard melodies that flow over a thumping bass drum. “I Wanna” appears just two songs later, a hard and fast powerpop contrast to some of the less aggressive tracks on the album. And though Grand clocks in at a hair less than 30 minutes, the short span doesn’t reflect a lack in substance; instead, the album’s 11 tracks just get played twice as often. Want to hear those 11, plus a whole slew of others from their debut album? Drop by Chop Suey on Dec. 29 for one of the best shows $10 can get you into.